Tokyo-based game company Square Enix announced that it believes the third-party server, which hosts its online shop, was breached. While the landing page can be accessed, the Square Enix Online Shop is currently offline and clicking on the Japan catalog brings up a notice about the hack. Square Enix is currently assessing the extent of the breach and trying to determine what, if any, personal data was compromised. "To this point, we have not identified any personal data that was actually downloaded and/or removed from the server," Square Enix said in an official notice. According to Square Enix, the server did contain non-financial data, such as names, mailing addresses, phone numbers and email addresses. It did not contain credit card info for US customers. Regardless, Square Enix is recommending that customers monitor their credit cards for suspicious activity. "We sincerely apologize for any inconvenience caused by the suspension of the Square Enix Online Shop," the company stated. "We take data security extremely seriously and we regret any inconvenience this may have caused our customers and fans. We appreciate your patience and support at this time." 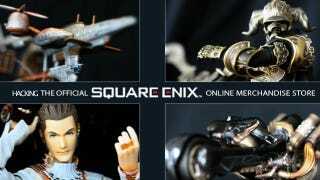 The Square Enix Online Shop opened in the West back in 2007.